Chances are you probably don’t know the name Johannes Vermeer. Until reading this Vanity Fair article on the Vermeer controversy, I didn’t. But his is a fascinating story, both at the time of his work in the 1600s, and today, as people puzzle over how he did what he did. What he did, was paint masterpieces. Appearing virtually out of nowhere at 21, with no training of note, he began produced work that would, years later, become incredibly valuable. But lots of artists do that, right? What makes Vermeer’s case special is that the speculation that some sort of optical device enabled him to create his art. You have experts weighing in on both sides of the debate. Where this gets really interesting is when you meet Tim Jenison. Jenison is the founder of NewTek and has spent his career making hardware and software for video production. Along with that, he’s a tinkerer. Upon learning about Vermeer from his daughter, he took up the challenge. After years working out the system with materials available in the Vermeer era, he ended up with an answer to the riddle of how Vermeer might have done it. The story gets even better as Penn & Teller join the party. Upon learning of Jenison’s project, they decided to make a documentary of the whole process, getting their chips in the game before they even knew if it would all work. The result is a film called Tim’s Vermeer that will be released in February. The story at Vanity Fair is fascinating, as the film certainly should be. 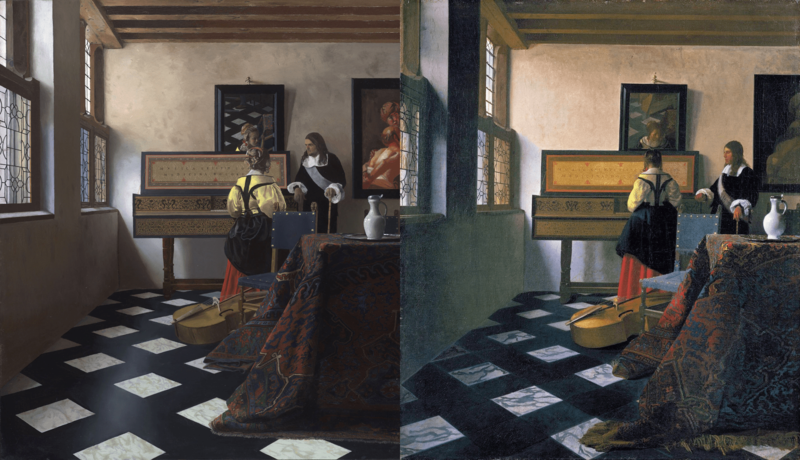 The image at the top shows the real Vermeer and Tim’s version using his method. Click it to get a closer look, and decided for yourself how close he may, or may not, be.